The Taylor 110 is a “budget” range guitar offered by one of the most renowned acoustic guitar manufacturers in the world, Taylor Guitars. With a higher price tag than most of its competitors, like most Taylor guitars, the 110 is aimed toward the serious guitarist, or even just the dedicated beginner. If Taylor could be summed up with one word, that word would be “wood.” Taylor is known for their use of exotic woods, as well as beautifully cut uncommon, and sometimes even average woods. These woods are what give a Taylor guitar its personality, and they work well together in terms of dependability and solidity. Taylor guitars are built wonderfully, and the 110 has just as much precision and care put in to its building as Taylor’s more expensive models, which is very pleasing, considering most higher end companies have a large gap in quality assurance between price ranges. The top and neck of the Taylor 110 has Taylor’s usual varnish on it, which feels nice and smooth in your hands without feeling too thick or sticky, as some finishes tend to feel. The varnish also takes care of sweat very well–you will notice, when playing the Taylor 110, that sweat does not cause slippage. However, the back and sides are laminate, and while they are high quality laminate, it would be nice to see a different cut, and finish, on these parts of the guitar, as better cut, lesser woods would have better tonal properties than any laminate. 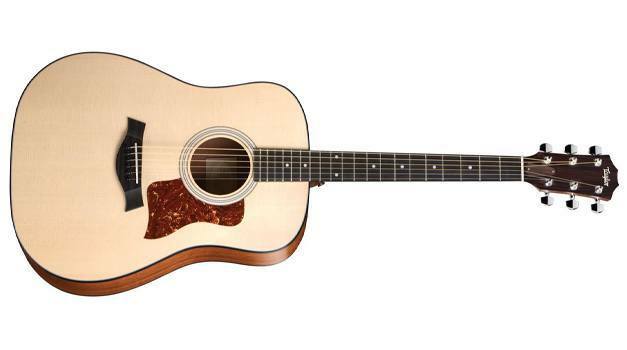 Not surprisingly, the Taylor 110 plays just like you would expect a Taylor to play. It feels solid and has a comfortable shape to it, despite the full dreadnought body. The wood is softer than usual laminate, and even the laminate is softer than most laminates, which maintains the feeling of a fully natural guitar, which means you will not have to worry about getting that “made from a desk” guitar feel. Out of the box, the action on the 110 was better than almost any other guitar in its price range–nice, low strings, but not so low that they buzzed on the frets or had any dead notes. Taylor does wood better than almost any other guitar manufacturer in the world, and you can always hear the difference between a Taylor and another guitar. The 110 sounds beautiful; it resonates well, chords are colorful and alive, and separate notes are distinct whether you are barring a chord or playing a solo. Quite simply, the woods in the Taylor 110 work absolutely perfectly together, and for the budget, finding a better sounding guitar will be very difficult.